Sunbathing on the ship’s deck while drinking cocktails all day sounds pretty appealing doesn’t it? If you said yes, then it sounds like a pirate's life is a life for you! We should have mentions that by ship we meant pirate ship and by cocktails we meant straight up rum, hope your still down for both! 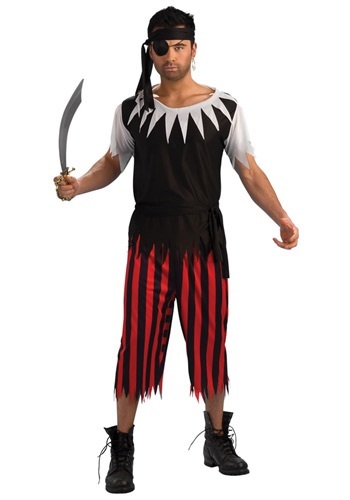 Good, then for Halloween this year how about you wear this swashbuckler costume. You'll look like the captain of the high seas when you sport out Men’s Pirate Costume! This pirate costume is so comfy you could even sleep in it, however we don’t recommend that because being a pirate you should always be on the lookout! Black, white and red stripes you will be unmistakable for the captain of the S.S Fun! Anyone who disagrees will be sentenced to walk the plank! Just ask the last guy, who disagreed with us, oh wait you can’t! Combine our Men’s Pirate Costume with some of our great pirate accessories such as an eye patch or a sword to fight out your enemies. Shiver me timbers you’re looking like quite the buccaneer! You’re ready for night full of pirate shenanigans and treasure map hunting, and oh yes, plenty of rum! What is pirate after all without all of those things? And the answer to that is just a guy with an eye patch who likes to wear stripes.